Brilliant Cut Diamond Ring. This unique diamond engagement ring is set with a beautiful 0.30ct brilliant cut diamond which sits upon a diamond set shoulder twist shank with brilliant cut diamonds with a combined weight of 0.20ct. Hallmarked 950 platinum shank with a platinum four claw head. .. Brilliant Cut Diamond Ring. This unique diamond engagement ring is set with a beautiful 0.52ct brilliant cut diamond which sits upon a diamond set shoulder twist shank with brilliant cut diamonds with a combined weight of 0.25ct. Hallmarked 950 platinum shank with a platinum four claw head. 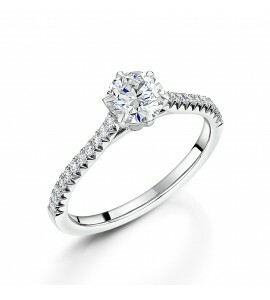 ..
Classic Pave Princess Diamond Ring 1.26cts. 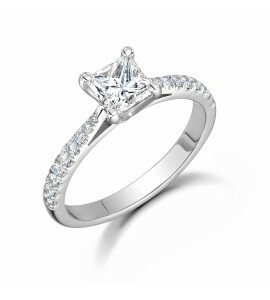 This striking diamond engagement ring is set with a remarkable 1.01ct princess cut diamond. Hallmarked 950 platinum shank set with 9 brilliant cut diamonds set on each shoulder weighing a total of 0.25cts with platinum four claw head. 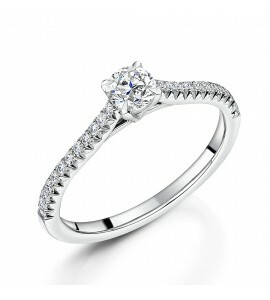 Total diamond weight ..
Diamond engagement ring is set with a 0.70ct brilliant cut diamond. Hallmarked 950 platinum shank with brilliant cut diamonds in a french cut setting on each shoulder wieighing 0.24cts with platinum six claw head. Total diamond weight of the ring is 0.94cts. This certified diamond ring comes with an..
Diamond engagement ring is set with a 0.40ct brilliant cut diamond. Hallmarked 950 platinum shank with brilliant cut diamonds in a french cut setting on each shoulder wieighing 0.24cts with platinum four claw head. Total diamond weight of the ring is 0.64cts. This certified diamond ring comes with a..
Diamond engagement ring is set with a 0.50ct brilliant cut diamond. Hallmarked 950 platinum shank with brilliant cut diamonds in a french cut setting on each shoulder wieighing 0.24cts with platinum four claw head. Total diamond weight of the ring is 0.74cts. 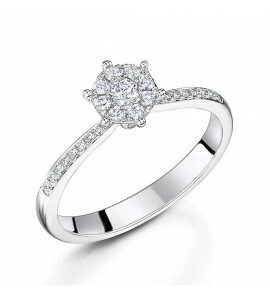 This certified diamond ring comes with a..
Diamond engagement ring is set with a single brilliant cut diamond surrounded by 8 smaller brilliant cut stones in a 6 claw cluster style setting. 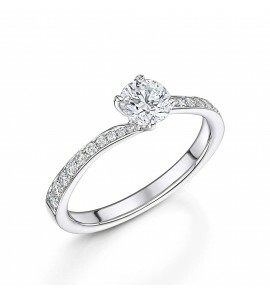 The combined carat weight of ring 0.25ct. Hallmarked 750 18ct white gold diamond set shank set with 20 brilliant cut diamonds and measuring 3mm wide and ..